Prime Minister Benjamin Netanyahu said Sunday that Israel had at the weekend carried out an air strike on Iranian weapons in Syria, a rare public confirmation of such attacks. "Just in the last 36 hours the air force attacked Iranian warehouses containing Iranian weapons in the Damascus international airport," Netanyahu said at the start of a cabinet meeting, according to his office. "The accumulation of recent attacks shows that we're more determined than ever to act against Iran in Syria, just as we promised." 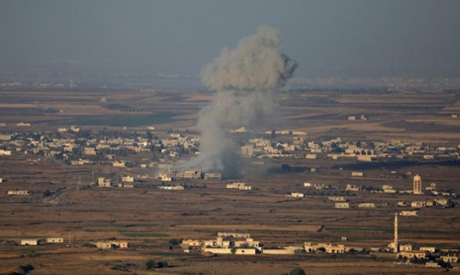 Late Friday Syrian air defences shot down Israeli missiles, Syria's official SANA news agency reported that day quoting a military source. "Only a ministry of transport warehouse at Damascus international airport was hit," SANA cited the military source as saying at the time. On Sunday Netanyahu said that Israel had attacked Iranian and Hezbollah targets in Syria hundreds of times. Israel has pledged to prevent its main enemy Iran from entrenching itself militarily in Syria, where it is backing President Bashar al-Assad's regime alongside Russia and Hezbollah. It rarely publicly confirms such strikes, though outgoing military chief of staff Gadi syria has spoken of them in interviews in recent days. Eisenkot told the New York Times that "we struck thousands of targets without claiming responsibility or asking for credit."